In an effort to quench their insatiable thirst for cheap lager and sports, World Cup fans have drained Moscow of its beer. The city is currently swelling with an international procession of soccer fans, all of whom consider getting rowdy part of the World Cup experience. Because beer and soccer are an ideal pairing, rabid fans have ordered so much of the golden elixir that restaurants and bars can't keep up with the demand. As reported by Reuters, the beer shortage has left waiters a bit flummoxed. "We just didn't think they would only want beer," a waiter told the publication. "There are really a lot of people in Moscow... and they are all drinking. It's hot and it's football." The server also said beer suppliers were taking about 24 hours longer than usual due to the excess demand. Hot weather and the world's preeminent sporting event has indeed caused demand for Carlsberg and Budweiser to spike to the heavens. A bartender named Dmitry who spoke to reporters said fans gulped their way through 800 liters in three days, opting for cheap fare over fancier stuff. "The sun makes them thirsty," he told Reuters. "In Russian we say 'to the bottom!' I like that these guys are embracing our culture." The assault on beer supplies hasn't just affected Moscow. After Sweden beat South Korea in its opening match last week in the host city of Nizhny Novgorod, rampaging Swedes drank so much beer that the city center ran completely dry. The western city's beer stock was already a bit threadbare, according to Sweden's The Local, so it's possible the drought would have occurred even if Swedish fans hadn't channelled their pillaging viking roots after the country's first World Cup victory in 12 years. The beer situation in Russia, while largely spurred by thirsty-as-hell fans, is also the product of the government's steep duties and bans on alcohol advertisements. 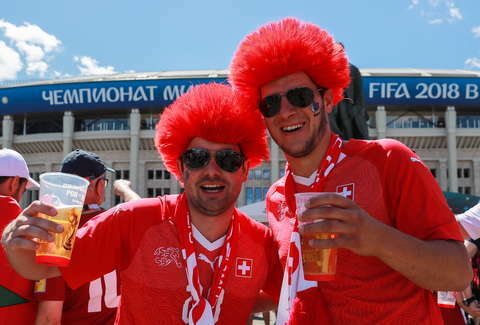 While beer consumption has risen dramatically with the influx of foreign fans for the World Cup, beer sales have fallen by about 33% over the last decade in Russia, per the report. Still, it's sort of become a point of national pride for fans to drink their faces off during the tournament: Australians, for example, hoovered up all the beer from several bars in the city of Kazan on Monday, rendering it a beer-less wasteland.